UPNG School of Business and Public Policy academic staff with UPNG Vice-Chancellor, Professor Albert Mellam, and Executive Dean, Professor Lekshmi N. Pillai (back-centre). 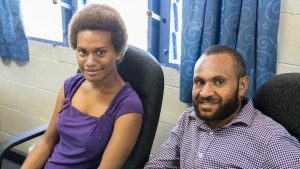 The University of Papua New Guinea’s School of Business and Public Policy will integrate gender equality into its curriculum, as part of a new approach to changing behaviours. A gender workshop was held at the university recently for the school of business staff to ensure gender issues become a part of student learning. The workshop was funded by the Association of Commonwealth Universities and facilitated through the Pacific Leadership and Governance Precinct. University Vice-Chancellor, Professor Albert Mellam, said that the institution had an important role to play in creating change. “Gender equality is so fundamentally critical to Papua New Guinea. This is one way of contributing to pushing back against these problems that are endemic across the world,” Professor Mellam said. The School of Business Executive Dean, Professor Lekshmi N. Pillai, said that the time is right to embrace gender equality and embed it as part of the curriculum. “Sustainable future growth must be based on the right principles, practices, and policies. Wasita Pomel, a Business Management tutor, and Nathan John, an Economics tutor, were among the participants at the Gender Equality Workshop. Head of Business Management Evelyn Kua said education is crucial for improving opportunities for women in Papua New Guinea. “Gender equality has been a foreign concept in the Papua New Guinean cultural context and that is a challenge which needs to be addressed. “Traditionally, men have been the decision makers and the providers of food, shelter, and protection – but these trends are changing. “We need to create a curriculum that can bridge the gap between tradition and the realities of today,” Mrs Kua said. The University’s School of Business will use the outcomes of the workshop to promote gender equality as part of its curriculum, as part of the Papua New Guinea Government’s Gender and Social Inclusion (GESI) Policy, and the Ethics and Values-Based Executive Leadership and Management Capability Framework. The Pacific Leadership and Governance Precinct is part of the Papua New Guinea – Australia Partnership to build a new generation of ethical and accountable public and private sector leaders. 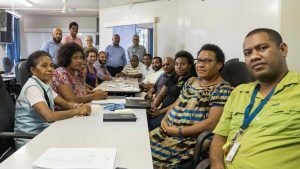 The Precinct also works to ensure the Government’s GESI Policy is rolled out among all its stakeholders, including the University of Papua New Guinea.